EVs could offset up to $15.4 billion in energy storage costs. Electric vehicles could become a vital asset for California grid operators who are struggling to bring more renewables online. The state’s rapid adoption of solar power is contributing to a problem known as the “duck curve” — a deep dip in demand during solar-saturated midday hours, followed by a steep ramp in the evening as solar power fades away. Regulators have responded by mandating that the state’s three biggest utilities procure a total of 1.3 gigawatts of energy storage by 2020. 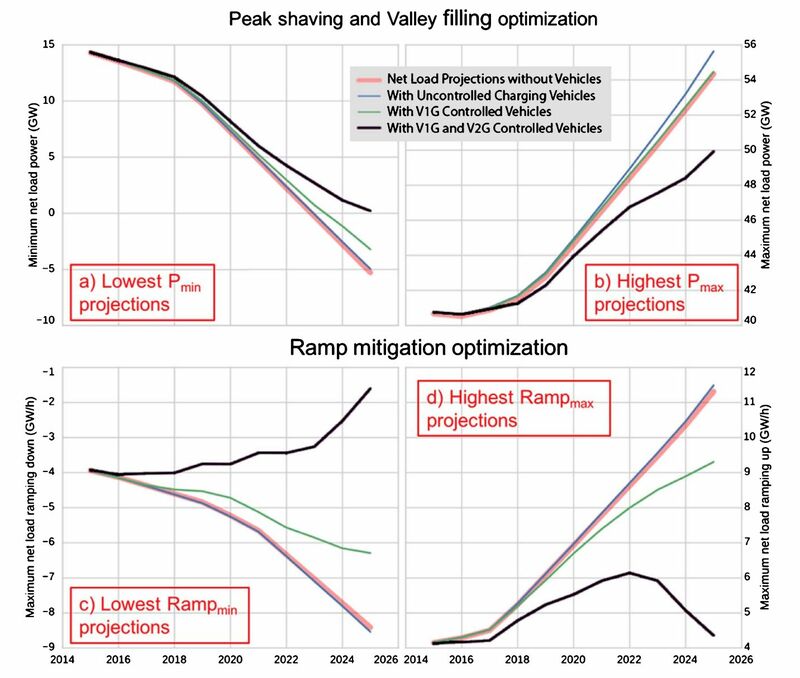 But researchers say they’ve found a more effective way to mitigate the duck curve using strategic EV charging. Scheduling electric vehicles to charge in the middle of the day rather than the evening would help balance the grid by storing surpluses of electricity that would otherwise need to be curtailed. The effect on the duck curve would be equivalent to adding 1 gigawatt of storage capacity at a cost of $1.45 billion to $1.75 billion, according to a new analysis from the Department of Energy’s Lawrence Berkeley National Laboratory. “Our results show that…California can achieve much of the same benefit of its Storage Mandate for mitigating renewable intermittency, but at a small fraction of the cost,” wrote the paper’s authors. If some vehicles feed electricity back to the grid during peak evening hours, the benefits become even more pronounced. A mix of vehicles doing one-way and two-way charging would shave almost 5 gigawatts off daytime over-generation and evening peak demand, while keeping up-ramps and down-ramps within current levels. If just 30 percent of workplace chargers and 60 percent of home chargers allowed EVs to provide power to the grid, it could offset up to $15.4 billion in stationary storage investment, according to the study. Researchers say the cost to implement such a plan would be relatively small, because most of the technology is already in place. Grid operators would theoretically be able to control charging in real time using software inside the vehicle, charging station, or both. “A lot of vehicles are already internet-connected devices…so if it’s possible to use the existing communications channel to get this additional value for the grid, that’s fantastic,” said Samveg Saxena, a researcher at Lawrence Berkeley National Laboratory who worked on the study. The research relies on forecasts for EV adoption in California, which predict there will be half a million fully electric vehicles and 1 million plug-in hybrid vehicles on the road by 2025. California’s Air Resources Board has a zero-emissions vehicle (ZEV) mandate requiring that car manufacturers deliver a certain number of plug-in, battery and fuel cell electric and hybrid cars to consumers. By model year 2025, full ZEV vehicles — such as battery-only electric or hydrogen fuel cell vehicles — must make up 16 percent of required credits, which are calculated as a percentage of an automaker’s conventional light-duty vehicle sales. Despite being the nation’s largest electric vehicle market, California still has a long way to go to reach those numbers. As of October 2017, the state had 337,482 zero-emission vehicles, representing 4.5 percent of the state’s total vehicle fleet. 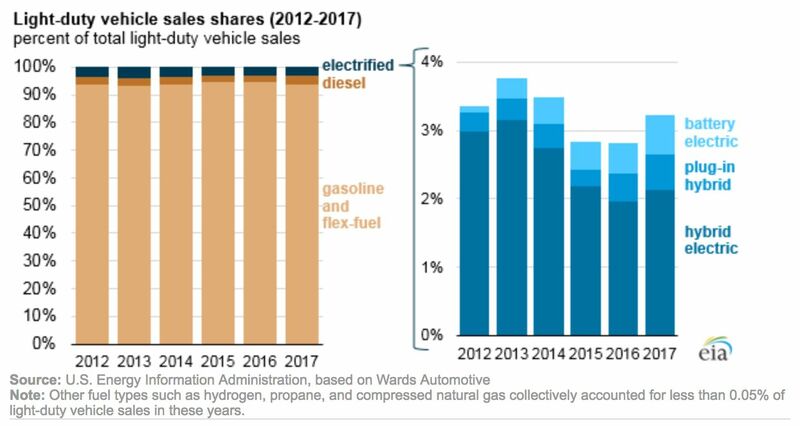 Nationally, "electrified vehicles" represent between 2.5 percent and 4 percent of light-duty vehicle sales, according to the U.S. Energy Information Administration. The vast majority of those cars are hybrid electric vehicles, like the Toyota Prius, and can’t function as grid resources. The Edison Electric Institute, which represents the country’s investor-owned utilities, projects the entire U.S. will have 7 million EVs by 2025. 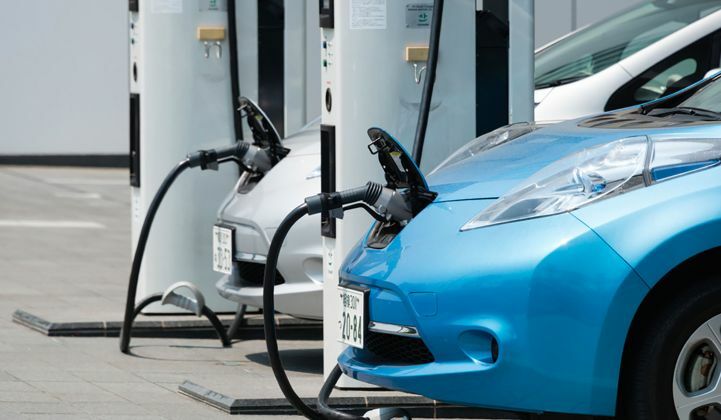 “With some very modest changes to the charging network design, we can leverage a resource that’s already been privately purchased and use it for a public good,” said Jeffery Greenblatt, the founder of Berkeley-based Emerging Futures and one of the study’s authors. Greenblatt said regulators are unlikely to change course on the state’s current energy storage mandate, but he’s hopeful EVs will have an opportunity to participate in future versions of the rule.